SAULT STE. MARIE---The Escanaba Eskymos have been oh-so-close in quite a few games this season. And on Saturday in Sault Ste. Marie, the boys found themselves locked into a pair of down-to-the-wire battles at the Sault Baseball Invitational. The Eskymos lost them both, falling to the Shepherd Blue Jays and the Sault Ste. Marie Blue Devils by identical 6-5 scores. Escanaba did manage a 9-0 win over the Alpena Wildcats in the middle game of their tripleheader, finishing 1-2 in the daylong event. Cam Beversluis catches a fly ball in left. The result left the Eskymos with a 19-12 record, heading into their final game of the regular season on Wednesday against Gladstone. Then, it's back to the Soo for the district tournament next Saturday afternoon. It was an early start for the Eskymos, as they faced off against the Blue Jays from Lower Michigan in a 10 a.m. game. It was played on the Soo's second field, Laucks Field, that has a fence that is only 305 feet away from home plate in all three fields. The field is also missing a first-base dugout, as the City of Sault Ste. Marie tore out the old one because of safety concerns. A new one will be built this summer, but for Escanaba's first two games on Saturday, the kids sat on a bench underneath a tent. In the opener against Shepherd, David Falish got the ball for the Eskymos, and he gave up a three-run homer to Blue Jays pitcher A.J. Travis. Escanaba got two runs back in the bottom of the inning on an RBI hit by Devin Olsen and a groundout by Ian DeMarse. The Blue Jays scored three more runs in the third inning to take a 6-2 lead, as Avery Hohlbein drove in Ryan Cline (who was safe on an error and stole second). Then, clean-up hitter Chris Williams hit a two-run homer to put the Eskymos into a 6-2 hole. Escanaba got a run back in the bottom of the inning, and then scored two more in the bottom of the fourth. Nick Vandermissen gets robbed of HR. Trailing 6-5, Nick Vandermissen ripped a long shot to center field. The ball carried over the center field fence for an apparent two-run homer, but Shepherd ceter fielder Derek Starks leaned over the fence and caught the ball, robbing Vandermissen and the Eskymos of the go-ahead runs. Falish, meanwhile, kept the Blue Jays off the board in the fourth and fifth innings. Bailey Lamb at the plate vs Shepherd. Then, when Falish allowed a lead-off single to Devon Van Bonn to start the sixth, the Eskymos turned to sophomore Devin Olsen to keep it a one-run game. Olsen did, getting the next three outs, setting up a dramatic bottom of the sixth inning (all of the games in this four-team tournament were only six innings long, rather than the usual seven). With one out in the bottom of the sixth, Ben Kleiman and Vandermissen both drew walks, and advanced on a passed ball. Bailey Lamb came to the plate with two men in scoring position and roped a shot toward left-center field. But Hohlbein raced over from the shortstop position, caught the ball, and then touched second for a double play. Bailey Lamb Robbed of walk-off Hit. Escanaba's bad luck continued, as the game ended. It was another one-run loss for the Eskymos. Falish took the loss on the mound, allowing six runs (five earned) on nine hits in five innings. Shepherd had 14 fly-outs in the game, unusal for a six-inning game that had only 18 outs. Shepherd improved to 24-7 on the season, then added a 25th win by beating Sault Ste. Marie, 6-4, later in the day. Meanwhile, a heartbroken Eskymo team stayed in its tent on gthe small field to face the Alpena Wildcats. And the Eskymos took charge early on, as sophomore Ben Kleiman got the ball and was in complete control on the hill. Ben Kleiman pitched a four-hitter. Kleiman retired the first eight men he faced, using a devastating curveball to keep the Wildcat batters off-balance. And while Kleiman struck out five Alpena betters in the first three innings (three of them looking), his teammates gave him some offensive support. And the big inning for Escanaba was the top of the second inning. Alex DeHaan singled, Falish walked, then Lamb singled to load the bases. The next two batters struck out, and it looked like the Eskymos would squander another golden opportunity to score. But Cam Beversluis came through with a home run over the short Laucks Field fence....a grand slam home run that gave the Eskymos a 4-0 lead. Falish would add a two-run hit later in the game, and DeHaan had three hits and a run batted in just hours after graduating from Escanaba High School, and the racing to the Soo to get there just minutes before the Eskymos' morning game against Shepherd. Lamb also had three hits and Vandermissen added a pair of singles. Esky had 13 hits. Kleiman earned the win on the mound for Escanaba, striking out seven batters and walking just one in a complete-game effort. Alpena (17-16) got two hits from Dylan Hoes and Wildcat pitcher Brady Marwede took the loss, allowing seven runs on nine hits in 5 1/3 innings. Bryce Blankenburg finished up for the Wildcats, giving up two runs on four hits in 2/3 of an inning. Eskymo fans enjoy the comforts of James Field after two games on small JV field. So, with a 1-1 record on the day, the Eskymos walked over to the big James Field, to face the host Blue Devils. 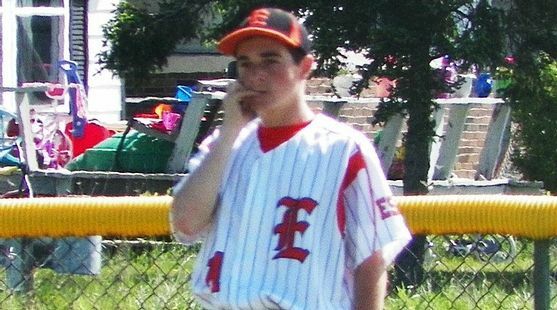 Escanaba was facing Soo pitching ace Tyler Kirkland, who has reportedly clocked throwing in the 90's this year, and who had an 18-strikeout performance earlier this season against Rudyard. But the Eskymos got off to a promising start in the first inning, loading the bases on a walk and two errors. But Kirkland got Falish on strikes and Lamb bounced out to end the threat. DeHaan was pitching for the Eskymos, and retired the first five men he faced before giving up back-to-back hits in the bottom of the second inning. Meanwhile, Escanaba grabbed a 4-0 lead in the top of the second inning as Kirkland struggled with his control. He walked Olsen to lead off and Tim Lueneburg had a single to keep the inning going. Austin Young had an RBI single in the inning, and two runs came in on a passed ball and a wild pitch. And a run scored when Vandermissen was hit by a pitch and eventually stole home as Young stole second after his base hit. So, it wasn't pretty, but DeHaan was staked to a 4-0 lead.A nd in the bottom of the third inning, he struck out the first two men he faced. But the Blue Devils put on a two-out rally that started with an infield hit by Frank Bailey. Kirkland followed with a hit, then Devon Dear followed with an RBI single. The Soo batters continued to pick on DeHaan's change-up as Sean McGahey smacked a two-run single. It was now 4-3. Eskymo sophomore Travis Heller bats. In the top of the fifth inning, Falish led off with a single and stole second. With one out, Olsen also drew a walk, and then Lueneburg was safe on an error to load the bases. Beversluis came through with an RBI single to left to score one run, but Jeff Lyle (running for Olsen) was thrown out at the plate. Then, Kirkland uncorked a wild pitch, but Luneburg was thrown out trying to score after the ball hit the backstop and bounced back toward the plate. It was 5-3, but two men thrown out at home plate. And in the bottom of the fifth inning, those two plays became magnified as the Blue Devils went on another rally. Ryan Wollan led off with an infield hit and went to second on an error. With one out, Kirkland ripped a double to cut the Eskymo lead to 5-4. DeHaan managed to strike out Dear for the second out, but the Soo had another two-out rally. McGahey ripped an RBI single to tie the game (his third RBI of the game), but the Eskymos thought they had runner Ben Formolo at the plate on the cut-off throw. Soo player safe or out at plate? Olsen's throw from third appeared to be in time as Eskymo catcher Sean Bissell applied the tag. But the umpire ruled that Bissell had blocked the plate illegally without the ball, so the run was allowed to score, tying the game at 5-5. Then Lucas Krupa smoked an RBI double down the left field line to give the Soo a 6-5 lead. The Eskymos went scoreless in the seventh inning, and the game ended up being yet another case of "one that slipped away" for the Orange and Black. Kirkland pitched a complete game to earn the win, yielding seven hits and five runs (four earned). He struck out 10 Eskymos, but walked five and hit a batter. DeHaan takes the loss, going 4 2/3 innings, allowing six earned runs on ten hits. He fanned five. Escanaba hosts the Gladstone Indians in the final game of the regular season Wednesday night. Game time from Al Ness Field is 6:00. The game will be broadcatst live on WCHT-AM (600), and on-line at www.rrnsports.com. To see more pictures and videos from these three games, and to listen to some audio highlights, click the thumbnails in the 'ARTICLE HIGHLIGHTS' box on the top of this page. Our thanks to Kevin Lyle! !